Everyone says we need to blog regularly. Have you tried it? Yes? Have you gotten any traction out of it? No? Well, are you sure you’re writing about the correct topics? So many questions. But if we want to draw potential paying customers to our sites, we need to nail down some answers regarding what they want to read about. That takes a blogging strategy. For our purposes here, this means approaching everything in terms of the perceived needs of buyers, vs. what we personally would like to blog about. As if that isn’t enough of a challenge, most of us sell more than one type of product or service to more than one type of customer. In targeted marketing, we use buyer personas to help us understand, and focus on, the various types of people we need to appeal to. Of course, each has to be approached within the context of their own challenges, goals and circumstances. 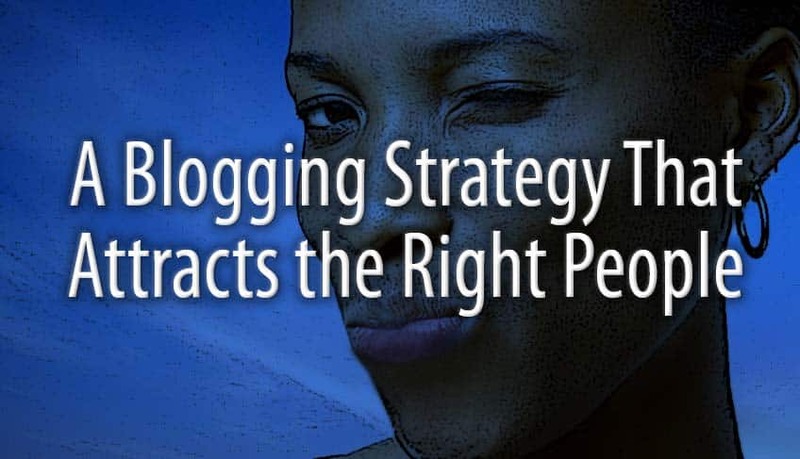 Buyer personas can also help us develop an enlightened blogging strategy. Here, we don’t have to make up details of their lives. We just need to understand what’s stressing them out. Start by asking three questions about each persona. The answers should help you get started down the right blogging trail. Question one: What are they trying to achieve? Put yourself in their shoes, whether it’s a new mom, or a corporate EVP for International Operations (could be both, of course). It might be a one-time to-do item, or an ongoing responsibility. Question two: What’s standing in their way? It seems we humans spend most of our time dealing with the obstacles that pop up in the course of trying to complete the main task. Question three: What do they need to resolve their issue? If our knowledge, expertise and capabilities can help them overcome their challenge, then that’s what we should blog about. And here, specific is better than general. Will all that time I spend blogging guarantee me an immediate tsunami of new customers? No, I didn’t think so. Maybe your genuinely helpful, non-salesy blog post will give them what they need to overcome their own obstacles and achieve their own aims. In that case, power to them. But hopefully you’ve made enough of an impression to be remembered the next time they or a colleague has a need. Or maybe they’ll share your post with their social followers. That’s an essential component of content marketing strategy. Or, maybe your words will make perfect sense to them, but they know they can’t pull this off themselves. Perhaps they’ll attempt it, and get frustrated. In either case, you now have the inside track for being their (paid) provider of choice. Let’s try an example: a landscaping company that serves homeowners and local businesses. In addition to offering regular weekly yard service, they also specialize in exotic flowering plants from around the world. So, 2 different markets x 2 core offerings = 4 buyer personas. What are they trying to achieve? They want a nice yard, of course. What is standing in their way? The ongoing expense of weekly yard service. What do they need to resolve their issue? Types of slow-growing lawns and shrubs that would only require yard service every other week. What are they trying to achieve? A garden that stands out from all their neighbors. What is standing in their way? Landscaping companies and nurseries that only offer the most common types of plants. What do they need to resolve their issue? Learning about available exotic flowers that would do well in their climate. What are they trying to achieve? Commercial properties that look nice year round. What is standing in their way? Greenery that dies or turns brown when there’s not much rain in the summer. What do they need to resolve their issue? Finding varieties of hardy, drought-proof shrubs and plants. What are they trying to achieve? Unique, impressive landscaping. What is standing in their way? Exotic plants that only bloom in the spring and summer. What do they need to resolve their issue? Discovering exotic plants that bloom in the fall and winter. Keyword research will also reveal topics folks are interested in. Including the right keywords in your blog title and text will help people researching those topics to find your posts online. At the very least, Google the term “slow-growing lawns” to gauge if there’s overall interest in the topic. Taking it further, using a keyword tool can help you find topics people are searching for, but maybe not too many are writing about. If there are other blog posts out there about your topic, see if you can find a different angle or a more specific focus, like “slow-growing lawn seed for the Southeast.” Or “slow-growing shrubs for commercial landscaping.” In the world of search, a series of long-tail keywords like that are likely to serve your blogging strategy well in the long run. Join some discussion groups on social media platforms, to see which terms and topics are popular. There will be groups for homeowners, and groups for professional landscapers. Each will have their own approach, hot topics, and terminology. Otherwise, since we’re all so close to our own businesses, we can miss the wider picture in terms of evolving industry trends and consumer needs. Remember, a smart blogging strategy starts with what other people are interested in. Writing about your own personal interests may only guarantee an audience of one. Begin by sitting down and brainstorming a long list of possible blog topics. Focus on the ones that offer a direct connection between the needs out there, and your deliverables. But remember of course that blogging is about helping, not selling. The whole idea of Content Marketing is a soft-sell approach, drawing folks to your blog as a genuinely knowledgeable and helpful resource. Getting some of them to then check out the products and services on the rest of your site starts with a blogging strategy that attracts the right people. How do you then convert them to actual paying customers? You’ll learn more about that in An Atlanta Copywriter Shares 3 Surprising Secrets.